Studies dealing with hymenopteran venoms are almost exclusively concerned with the venoms of the honey bee (Apis mellifera) or, to a minor extent, of wasps belonging to the family Vespidae (Habermann, 1968, 1971, 1972). Although the sphecid and pompilid wasps possess paralyzing venoms of great pharmacologic and physiologic interest, they have attracted only very few research groups to study their intriguing effects. 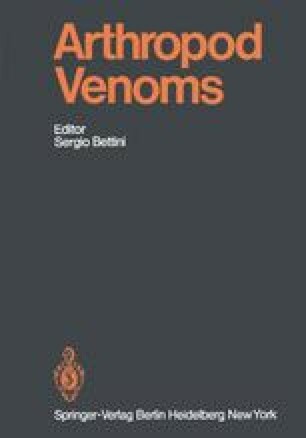 In a recent, most comprehensive survey on the biochemistry, pharmacology and toxicology of the constituents of hymenopteran venoms (Habermann, 1968) only half a page is devoted to the paralyzing venoms of Sphecidae. A somewhat more lengthy treatment of paralyzing venoms of solitary wasps is to be found in the reviews of Beard (1963), and Piek and Simon Thomas (1969).